Give yourself home-away-from-home luxury, safety and convenience, no matter where you are travelling. 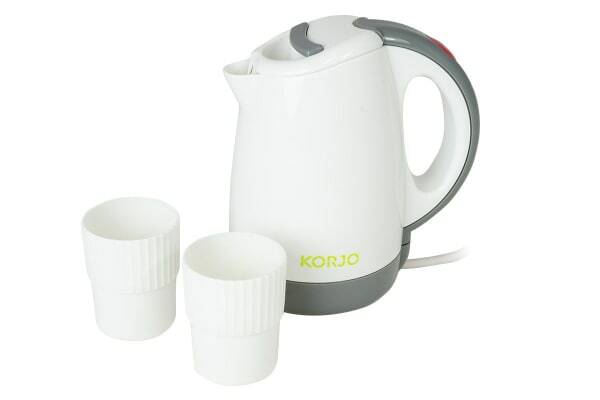 For any holiday large or small, this Korjo Travel Jug/Kettle with 2 Cups is the perfect solution to settle your hot drink or soup cravings. Guarantee yourself a hygienic and delicious hot drink, made from your own portable kettle. Safe to use in any country, it features an automatic safety cut out if power failure occurs. The perfect size for 2 hot drinks, it’s 400ml design fills the 2 included cups perfectly.